Ambarrow is the western side of Sandhurst parish, but it could hardly be called a hamlet. Ambarrow & Edgebarrow Hills are said to be the result of some great battle between the Saxons and the Danes, the dead from each side being buried beneath them. In fact, both are perfectly natural hillocks. The grounds of Ambarrow Court are now an attractive country park, especially when the bluebells are in bloom. The huge old house there was built for Lieut-Col. George Sheppard Harvey in 1885. It was his retirement home after having served his country in the Royal Artillery, particularly in China. The Royal Aircraft Establishment moved in during the war, but the place was demolished in 1969. The name 'Sandhurst' is Anglo-Saxon and means 'Sandy Wooded Hill'. It is built on a small eminence overlooking the River Blackwater. There was a Royal Hunting Lodge here at the centre of Sandhurst Walke, an important sub-division of Windsor Forest. Hart's Leap Road is thought, by some, to be the site and marks the very edge of the forest. King George III is said to have been its last Royal visitor. Centuries earlier, Prince Arthur, elder brother of Henry VIII, crossed the River Blackwater at Sandhurst whilst on his way to meet his future bride, Princess Catherine of Aragon, Castile & Leon at Dogmersfield Park (Hampshire). The manor house of Sandhurst is in the Ambarrow area. It is called Sandhurst Lodge and stands on the edge of the parish some way from the usual position adjoining the church. It may contain remnants of a late 18th century house built by and for Richard Heaviside, the associate of John Nash. However the place was almost entirely rebuilt for Robert Gibson in 1858, in a rather unattractive Italianate style. It was later the country home of the well-known London solicitor, Sir William Farrer. He married one of the Shaw-Lefevres from Heckfield (Hampshire) and the couple laid out a famous garden in the grounds with large heated ponds of exotic water-lilies. They took a great interest in village life and are remembered by a fine monument in the parish church. The parish church of Sandhurst was originally a chapel-of-ease to the mother-church at Sonning. The present building, with its Surrey-style spire, dates almost entirely from a rebuilding of 1853. The main doorway is imitation Norman, but may be a replica of one in the old church. There are a few interesting old relics inside, including an ancient brass to Richard Geale and his wife (1608). The Geales were a prominent Sandurst and Yateley (Hampshire) family. In the mid-18th century, they ran the Rose and Crown, the oldest of the seven surviving pubs in the village. In the 1850s, two of the pubs were run by members of the Giles family, local farmers who apparently liked to retire into publicanism. However, one George Giles was arrested in 1858 after he got drunk at the Wellington Arms in Sandhurst and, apparently unprovoked, stabbed his friend outside in the road. The victim only survived because Giles hit his rib. 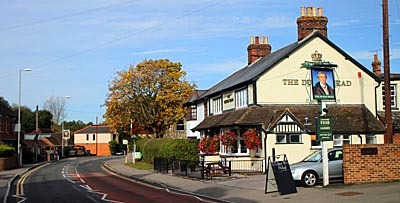 There are two pubs named after the Duke of Wellington in the village and there is another in Crowthorne (there were once two others in Crowthorne also). Crowthorne was part of the parish of Sandhurst until 1874 and the Duke's greatest memorial, Wellington College, was built there in 1812. He lived not far away at Stratfield Saye House (Hampshire) and the estate stretches into Riseley. Sandhurst is best-known today as the home of the Royal Military Academy. It was established in the parish, as the Royal Military College, in 1813 when moved from Great Marlow (Buckinghamshire). In 1946 it was merged with the RMA at Woolwich (Kent). The main buildings, designed by James Wyatt, are imposing but austere. The plain two-storeyed frontage stretches the length of the parade ground, broken only by a six columned classical portico. Also in the grounds, and of more historical interest, is 'Government House,' a late 18th century manor house which became the commandant's residence. It may have stood at the centre of the manor of 'Hall' which was owned by the Atte Halle family throughout the 14th century, but whose records disappear after 1498.